Dosa is a very popular South Indian breakfast (infact anytime) dish. There are many variations to the dosa, most notably Masala Dosa and Onion Rava Dosa. This variation is made with corn. Best served with chutney and sambar of choice. 1. Soak the corn kernels for 2 to 3 hours. 2. Soak the urad dal for 45 to 60 minutes. 3. Drain the corn and grind to a fine paste, adding some water as required. 5. Combine it with cumin seeds, curry leaves, red chillies and some salt. 6. Grind to a fine paste, adding some water as required. 7. Grind the onions to a coarse paste and add to the dal mixture. 8. Combine both the batters and mix well. 9. Keep aside to ferment for 8 hours or overnight. 10. Heat a dosa tawa over medium flame. 11. Pour a ladleful of the batter and spread evenly. 12. Apply oil around the edges and cook on both sides. 13. Serve with chutney and sambar of choice. 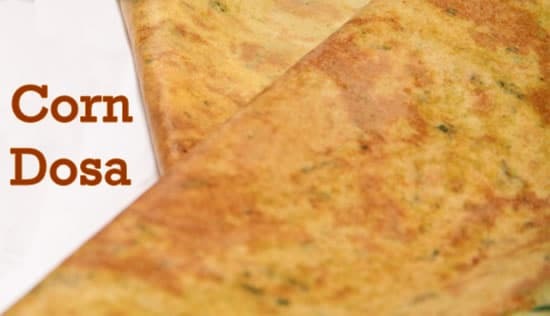 Feel free to comment or share your thoughts on this Corn Dosa Recipe from Awesome Cuisine.